Geotech offers a full line of pH buffers, conductivity and ORP standards, probe cleansers and storage solutions to help you get the best data from your water meter probes and sensors. The EPA recommends Luminox so solvent rinse can be eliminated. Alconox Powdered Precision Cleaner is effective on laboratory glassware, plastic, rubber, metal and other hard surfaces. Available in 4 lb. (1.8 kg) boxes or by the case. Luminox Low-Foaming Neutral Cleaner is a aqueous, low-ionic content, non-phosphate blend of organic solvents, surfactants, and rinse aids. Available in 1 gallon (3.8 L) containers. 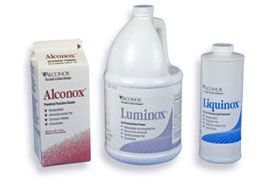 Liquinox Critical Cleaning Liquid Detergent for ultrasonic and manual cleaning. Available by the quart or by the case.